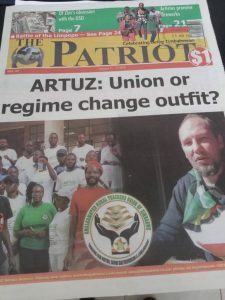 As the violent protest raged on Monday 14 January, Doug Coltart tweeted a thread about how a group of ARTUZ had demonstrated effectively without using any violence and how they had left the police powerless to arrest them. On Monday last week, the State deployed more than 200 police officers to Africa Unity Square to break up a small peaceful demonstration by the rural teachers union @ARTUZ16 who were singing and protesting the same issues in #shutdownZimbabwe: tax hikes, eroded salaries, etc. Then something remarkable happened. A senior police officer gave an order that the teachers—who were seated on the ground—should be arrested, but the junior officers refused to do so. They just stood there as the teachers sang. The senior officer was left pleading with them! We can’t know what exactly what was going on in the police officers’ heads. Maybe they resonated with the teachers plight since they are also public servants whose salaries have been eroded? Perhaps they knew it was illegal to arrest people peacefully exercising their rights? 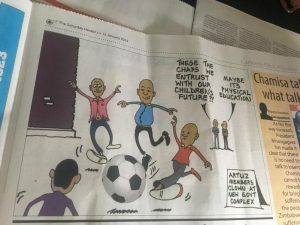 Eventually some police officers managed to drag the teachers—who had linked their arms together so as not to be separated—to a police van and took them down to Harare Central Police Station. I was deployed by @ZLHRLawyers to provide legal assistance to the teachers. At Harare Central, all the police officers were passing the buck: none wanted to take responsibility for the unlawful detention of the teachers. All feigned ignorance as to who had given the instruction. I asked if they had been arrested, and the officer in charge insisted they haven’t. So I said “Ok, I’ll leave with my clients then!” “No, no, no, you can’t leave. We are waiting for instructions.” he responded, somewhat embarrassed…. No one would take responsibility for the arrest. So I informed them that a colleague was drafting court papers back at the office to have it declared an unlawful arrest, and that the names of all the police officers involved would be cited. They panicked! The officer in charge called me over and said we could leave so long as no citizens joined the teachers’ march. I asked him “Who am I to agree to the restriction of other citizen’s rights? I can’t agree to that!” He conceded, and agreed to the teachers release without condition. I went back to the teachers and told them I’d been given clearance to leave with them and for them to proceed with their march. Elated they jumped up, & proceeded to march back to the spot they’d been arrested hours earlier, right from the depths of Harare Central Police Station. This was an incredible moment: to freely walk out of Harare Central with my clients, no charges, no conditions. I just wish this video captured the look on the faces of the police officers manning the boom gate as the courageous teachers toyi toyied straight past them! The teachers were undeterred by their arrest and marched straight back to the spot they’d been arrested at Africa Unity Square. In doing so, they demonstrated immense courage and determination. They knew their cause was just, and would not be put off by illegal arrests. The teachers demonstrated from Africa Unity Square to Ministry of Finance every single day last week. Without any violence, and without incident from the police. When the police arrested an ARTUZ member by mistake later that week, in a round up of vendors, they immediately let him go the moment they found out he was from ARTUZ. They’ve developed a respect for ARTUZ and a fear of consequences they’ll face if they violate their rights. The System is now terrified of ARTUZ. Last week, they ran a sustained media propaganda campaign trying to denigrate the teachers struggle for a living wage. They fear ARTUZ precisely because they are nonviolent, organised and disciplined. They know that’s what is effective. The point of this story is to show that there are many among our police force who don’t want to violate rights. They are given unlawful instructions from above, but there are many with a conscience who will outright refuse or who will buckle when citizens stand up to them. The police are also suffering. It’s only the corrupt elite at the top who are really benefiting. The ordinary police officer is suffering as much as the rest of us. He’s also earning worthless bond. And he’s asked to do the dirty work for the elite. Many of them aren’t happy. 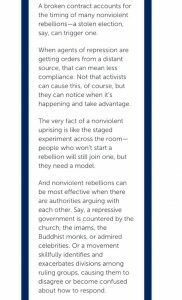 But it’s essential we maintain nonviolent discipline, just as ARTUZ did last week. If you use violence against the police, they will band together and even those who are sympathetic to your cause might be forced to band with other police officers when under attack. If you stay nonviolent but are also assertive, know your rights, and don’t back down, then at some point, some officers will remember that their first duty is to the Constitution and their nation Zimbabwe not the greedy, corrupt elite who use them to oppress us. When that happens, the elite are in trouble. They can only keep oppressing us & extracting the nation’s wealth for their own benefit, for as long as their agents of oppression continue to OBEY. But when they refuse to obey, the elite are powerless. 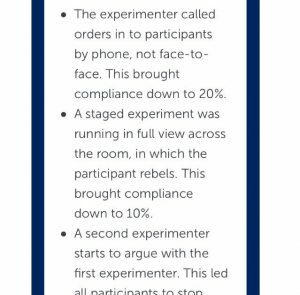 A fascinating study was conducted on what it takes for agents of repression to defect: https://www.nonviolent-conflict.org/blog_post/encouraging-agents-repression-defect-psychology-activists/ A major finding was that people will stop obeying orders to brutalize their fellow man when they see others stop obeying. As we saw last week, that has already begun!